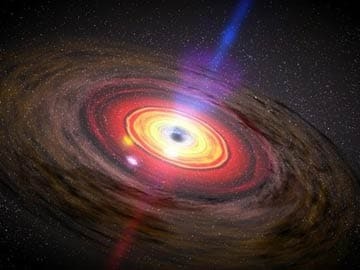 Washington: Black holes - the most dense objects in the universe that do not even let light escape - do not exist, a physics professor in the US has claimed. Laura Mersini-Houghton at University of North Carolina at Chapel Hill in the College of Arts and Sciences, has proven, mathematically, that black holes can never come into being in the first place. For decades, black holes were thought to form when a massive star collapses under its own gravity to a single point in space - imagine the Earth being squished into a ball the size of a peanut - called a singularity, researchers said. An invisible membrane known as the event horizon surrounds the singularity and crossing this horizon means that you could never cross back. It's the point where a black hole's gravitational pull is so strong that nothing can escape it, they said. The black holes pit two fundamental theories of the universe against each other. Einstein's theory of gravity predicts the formation of black holes but a fundamental law of quantum theory states that no information from the universe can ever disappear. Efforts to combine these two theories lead to mathematical nonsense, and became known as the information loss paradox. In 1974, physicist Stephen Hawking used quantum mechanics to show that black holes emit radiation. Since then, scientists have detected fingerprints in the cosmos that are consistent with this radiation, identifying an ever-increasing list of the universe's black holes. But now Mersini-Houghton describes an entirely new scenario. Mersini-Houghton agrees with Hawking that as a star collapses under its own gravity, it produces Hawking radiation. However, in her new work, Mersini-Houghton showed that by giving off this radiation, the star also sheds mass. So much so that as it shrinks it no longer has the density to become a black hole. The take home message of the work is clear: there is no such thing as a black hole, researchers said. The paper, which was recently submitted to ArXiv, an online repository of physics papers that is not peer-reviewed, offers exact numerical solutions to this problem and was done in collaboration with Harald Peiffer, an expert on numerical relativity at the University of Toronto. Experimental evidence may one day provide physical proof as to whether or not black holes exist in the universe. But for now, Mersini-Houghton said the mathematics is conclusive. Many physicists and astronomers believe that our universe originated from a singularity that began expanding with the Big Bang. However, if singularities do not exist, then physicists have to rethink their ideas of the Big Bang and whether it ever happened.